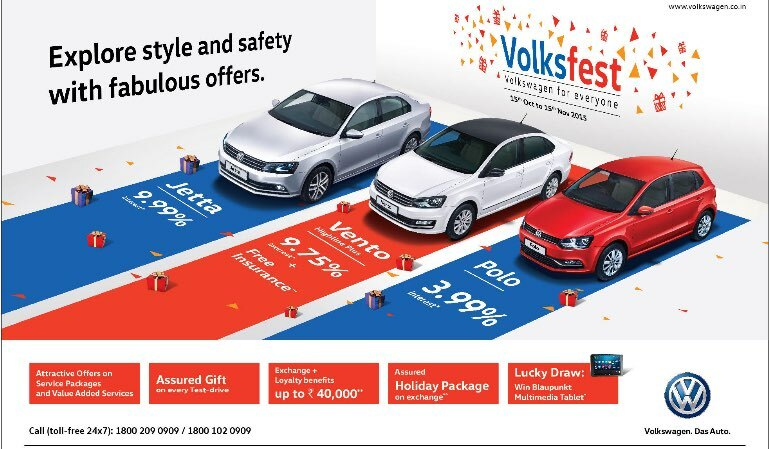 Volkswagen, Europe’s leading car manufacturer today announced ‘Volksfest 2015’ a 30-day mega carnival where the company’s existing and prospective customers can avail a range of attractive offers, holiday packages, exciting benefits and assured gifts on every test drive across all Volkswagen dealerships in India. With the onset of the festive season, Volksfest 2015 offers customers with valuable benefits on car finance and new car purchases. As part of this programme, prospective customers have the option of availing free 1-year insurance on the recently launched Vento Highline Plus. All Volkswagen cars are available with exchange and loyalty benefits of up to Rs 40,000, special financing schemes starting at 3.99% interest per annum, and lucky draws to win a Blaupunkt Multimedia tablet. Furthermore, there are assured holiday packages to be won, on exchange of Volkswagen cars at Das Welt Auto, Volkswagen brand’s pre-owned car division. Volkswagen is a leading carmaker in Europe, sells its broad model range, from the up! to the Phaeton, in more than 150 countries worldwide. Volkswagen currently offers the Polo, Vento and Jetta in India.